Looking at all the different topics that the EvenTiles series covers, I think it makes sense to at least have a table of contents for the series so far. For instance, if you are interested in reading something about tombstoning, it is not necessary to read through the entire series (although of course I invite you to do so anyway). 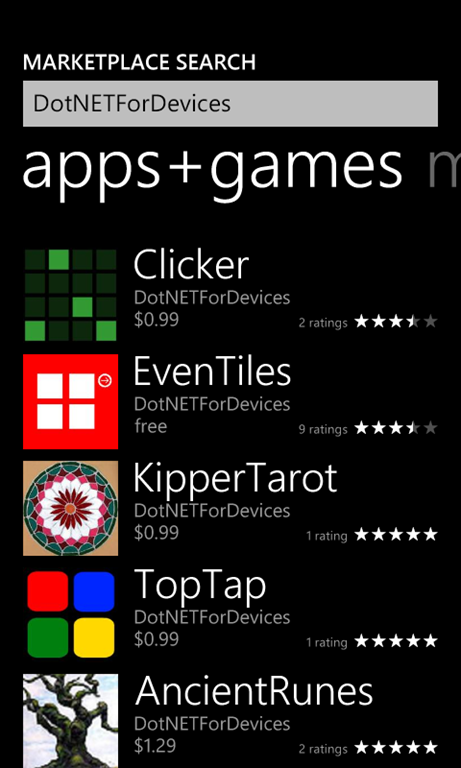 At this moment, EvenTiles explains how to use Windows Phone Tiles, including Secondary Tiles. 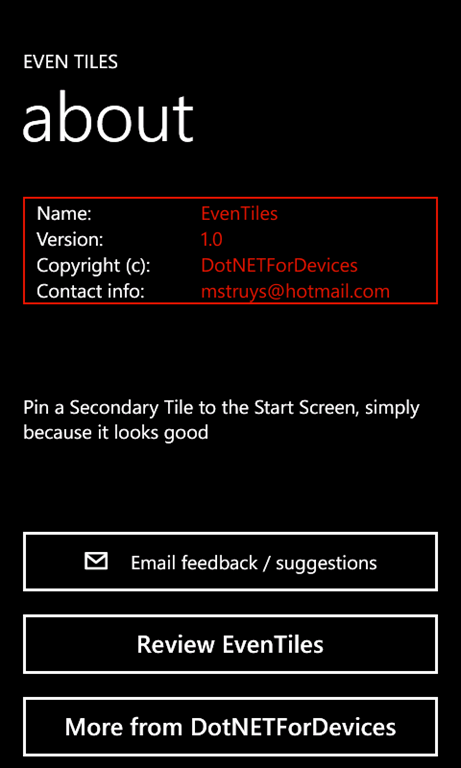 It also show how you can update content on your Tiles locally by using a Background Agent. Also don’t forget that all source code is available and each individual episode of EvenTiles contains a demo on video as well. The latest sample source code can be downloaded. Even though there are many more episodes of EvenTiles planned, attention will now move beyond tiles as we focus on using built-in applications and accessing device hardware. The NavigationFailed event is raised. This is caused by the fact that the MessageBox returns when clicking the phone’s Start button with a return value of MessageBoxResult.Cancel. 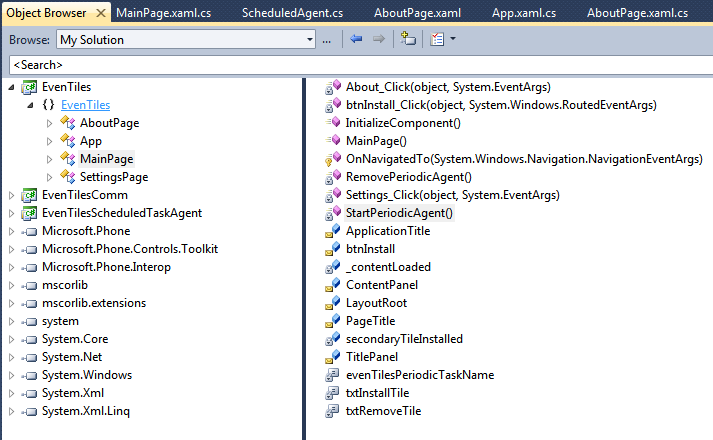 Since in the above code fragment, the Cancel button is used to navigate to some page, even though the application is supposed to go to the background in order to display the start screen on the phone, navigation fails. 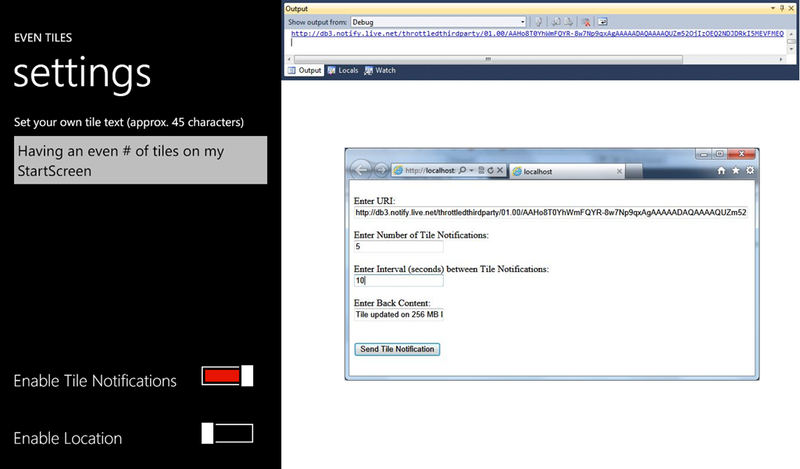 The interesting part is that the application does not have a clue that the user pressed the Start button on the phone. So some thinking is required to fix this issue. This does solve the problem, although I don’t like it that an exception is thrown in a situation that the operating system should somehow prevent us against (maybe by returning some other value when the MessageBox returns without the user clicking on one of its buttons). If you want to have a little more flexibility, and don’t mind coding a bit more, there is another possible solution. Instead of using a MessageBox, you can make use of the Guide.BeginShowMessageBox method that is defined in the XNA Framework. This method is a bit more complex, but also much more flexible then its Silverlight counterpart. BeginShowMessageBox is asynchronous, which means that you need to take care with calling code that is supposed to run on the UI Thread. The interesting code can be found in the EnteredAnswer method, where we retrieve the key the user entered in the message box. Since EndShowMessageBox returns a nullable integer, it has this nice way of using null in those cases where the user did not click any key (in other words, for instance when the message box is removed as a result of the application going to the background). So now we have a way of detecting if we can navigate (result has a value other then null). The sample code also sets a boolean variable messageBoxVisible, which is used in combination with PhoneApplicationPage.State to display the message box again when the user returns to the application. Hopefully this time the application will pass certification.